Please find attached the sound bytes from the above interview which ironically was his last show and we were the last to appear on it. We had no clue he was about to resign but now in hindsight we admire the way he chose to end on this note. 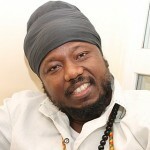 We salute Blak Rasta as an important voicez and an eloquent conscience of the people! And he spoke for them when others were always silent!